With Kem Sokha taking the permanent role of CNRP president, the opposition party on Tuesday named three new vice presidents, lawmakers Mu Sochua, Eng Chhay Eang and Pol Ham, according to party officials. The trio, along with Mr. Sokha, will need to be approved along with changes to the party’s bylaws during a meeting of the CNRP’s steering committee today and then at a party congress scheduled for Thursday. Tuesday’s decision came out of a meeting of the standing committee, made up of about two dozen of the party’s most senior officials. All of the vice president nominees initially declined to comment on the selections after the meeting. However, after party spokesman Yim Sovann confirmed Khmer-language media reports naming the three, Ms. Sochua said she was “honored” by the nomination, noting that it was not yet official. She declined to comment further. Mr. Chhay Eang said only that he would happily accept any position with the support of the party, while Mr. Ham referred questions to party spokesmen. 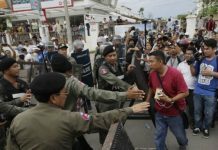 The shakeup of the CNRP’s leadership follows the shock resignation of longtime opposition leader Sam Rainsy earlier this month, a move meant to avert immediate danger as the ruling party pushes through legislation that would allow the government and courts to suspend or dissolve parties whose leaders are convicted of crimes. Mr. Rainsy is currently exiled from Cambodia and living in Paris, but also faces nine years in prison over a pair of convictions widely seen as being politically motivated. Mr. Sokha has been the party’s acting president since Mr. Rainsy entered what was initially self-imposed exile in November 2015. Mr. Sokha has been the CNRP’s sole vice president since his Human Rights Party merged with Mr. Rainsy’s eponymous party in 2012, forming a united opposition that nearly defeated Prime Minister Hun Sen’s CPP in the 2013 national election. The new leadership structure, though not specific members, was apparently endorsed by Mr. Rainsy in a conversation with Mr. Sovann that was leaked on Facebook last week. Mr. Rainsy declined to comment on the changes on Tuesday evening. Both Ms. Sochua and Mr. Chhay Eang were longtime lawmakers for the Sam Rainsy Party (SRP) before the 2012 merger, while Mr. Ham was a co-founder of Mr. Sokha’s party. All three also hold senior positions within the CNRP’s administration—Ms. Sochua as the director of public affairs, Mr. Chhay Eang as deputy head of the executive committee, and Mr. Ham as the head of the steering committee. 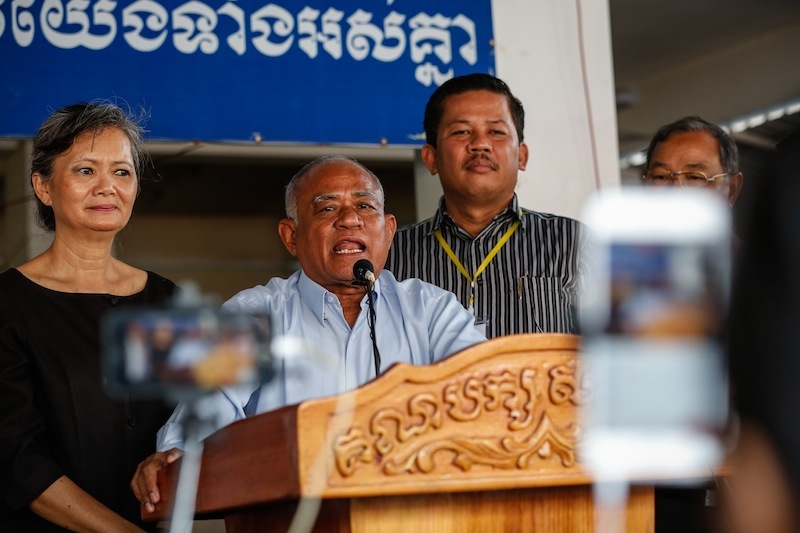 Mr. Ham, like Mr. Sokha, cut his political teeth as part of the democratic resistance to the socialist government in Phnom Penh during the 1980s. In recent years, he has occasionally served as the CNRP’s acting president, by virtue of being the party’s third-ranking member, when Mr. Rainsy and Mr. Sokha were out of the country. Ms. Sochua, who was educated in the U.S., entered Cambodian politics first as women’s affairs minister for the royalist Funcinpec party in the mid-1990s before defecting to Mr. Rainsy’s party. Mr. Chhay Eang has long been one of Mr. Rainsy’s closest confidantes, having previously served as secretary-general of the SRP, a position that was also once held by Ms. Sochua.